What on our blue planet is going on in this photo?! Well, this is William van Orden aka “Bilz Rockfish” of Quadra Island. Since 1995, he has been driven to make replicas of NE Pacific Ocean fish species and other marine life. It was my great fish-nerd joy today to spend some time with him and his wife Barb. Above, William is holding the mould from the exact fish in the image below. This is the King-of-the-Salmon that died near Oak Bay on September 21st, 2017 (Photo is from the Oak Bay News). For more on this remarkable species, see my blog item at this link. By making moulds of fish and marine invertebrates that have died as a result of bycatch or washing up like this, William can then make exact replicas for the purposes of education, conservation and art. Incredible care is taken to ensure that every detail is captured in the cast and that the painting is as accurate as possible for the species. Replica of the head of the September 21st, 2017, Oak Bay King-of-the-Salmon. Replicas of the head of the same King-of-the-Salmon. As a result of this, I learned that the nose can push outward as you see by contrasting the top and bottom casts (from the same fish). Presumably this would be to hunt prey which include “variety of fishes, amphipods, copepods, euphusiids [krill species], fish larvae, polychaetes [bristle worms], squids and octopuses.” Source: Love, Dr. Milton. Certainly More Than You Want to Know about the Fishes of the Pacific Coast: A Postmodern Experience. The fish you see in the background is a 71 cm long Opah (Moonfish). 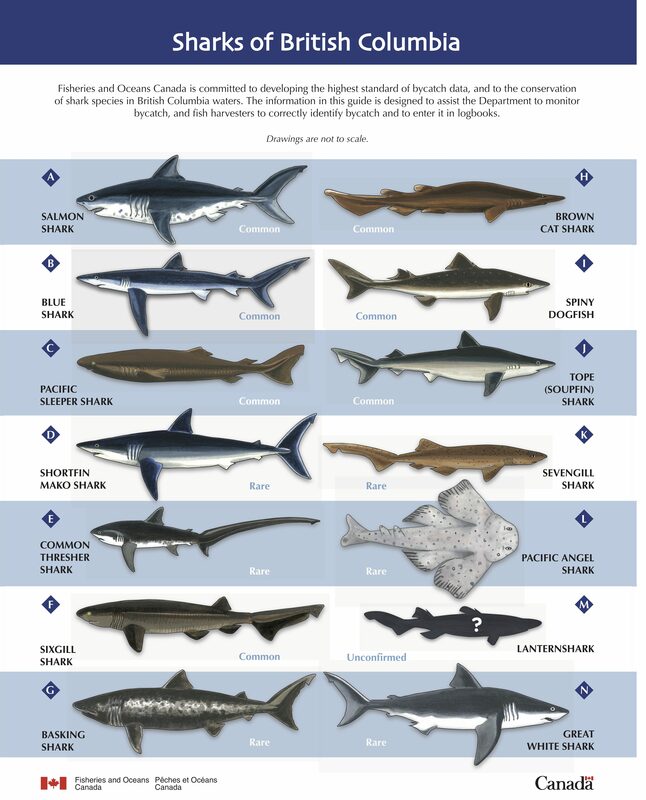 These are fish species that belong in the NE Pacific Ocean but we so rarely get to see them and their awe-inspiring adaptations. Indeed, the detail is remarkable (as is his wonderful ichthyology obsession). For example, today I realized why Starry Flounder must be called STARRY Flounder. See all the tiny star patterns on the fish’s skin? 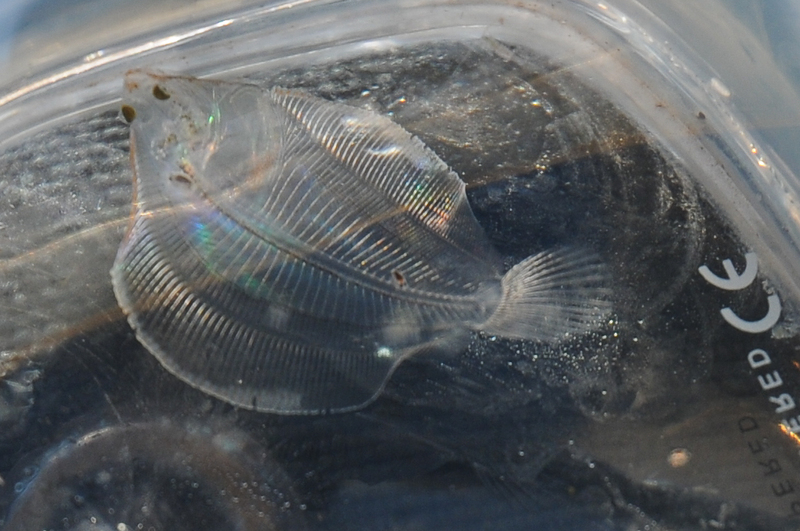 Cast of a 64 cm Starry Flounder. I also learned something more about the “design” of female anglerfish. Likely you know that anglerfish females have a lure that contains bacteria which create light (bioluminescence) to attract prey in the deep, dark depths that they dwell. This lure is marked “A” in my image below. What I learned from William is that the lure can be reeled in closer to the female’s mouth and . . . as “A” is drawn inward, “B” gets longer i.e. “B” is the counterweight to the lure appendage! 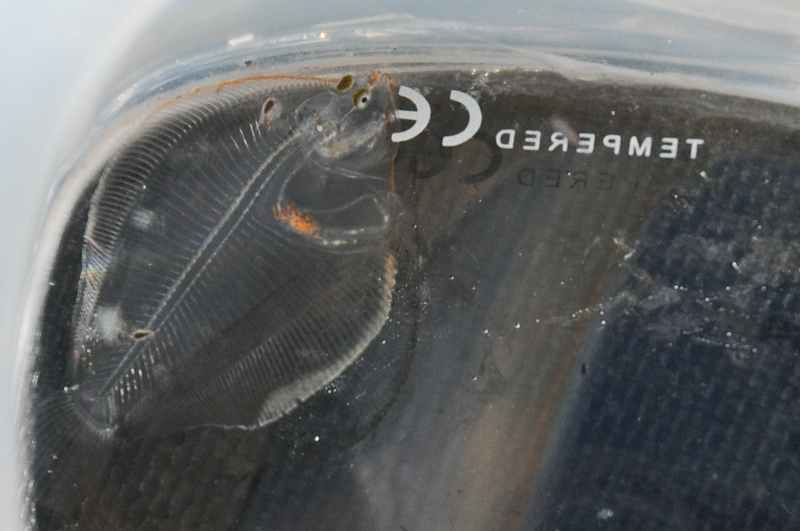 Speaking of appendages, see the little male attached to the female anglerfish? The male bites onto the female and fuses with her. He gets her nutrients. She gets his sperm. I have included a National Geographic video clip at the end of this blog that shows a mated anglerfish pair. 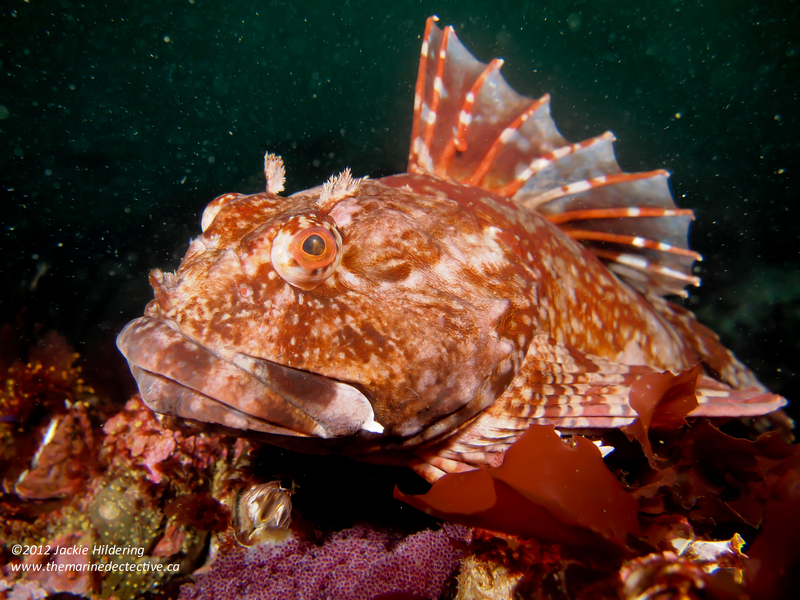 Below, is a cast of 90 cm Rougheye Rockfish determined to be at least 150-years-old. The age was determined by scientists counting the annual growth bands on this individual’s otoliths (ear bones). Research has determined that the species can even get to be 205-years-old! Other fish in this image are a Decorated Warbonnet (facing left below the Rougheye Rockfish) and, on the right, a deep-dwelling fish (a clue being the huge eyes to pick up on very low light) with the enchanting common name of Ox-eyed Oreo. 137 cm long Longnose Lancetfish. To the left, a male Steelhead (spawning stage). To the right, the Opah (Moonfish). And below, a 10 cm Pacific Spiny Lumpsucker. See him/her? I have wanted to see William’s workshop for a long time. We’ve been in communication over the years as we have just a few interests in common. 🙂 I have used some of his casts for educational purposes (e.g. his replicas of salmon species) and I might even have a few casts hanging near the shower. Hey! All the cool kids are doing it (at least we marine biology / diver types). But of course, there is also solemness to seeing the replicas of these awe-inspiring marine neighbours. They are the result of animals who have died. This struck me the most powerfully with what you see in the image below. These are Ochre Stars with Sea Star Wasting Syndrome, cast by William in an attempt to bring more awareness to the plight of the sea stars. He had also made a cast a of the species most impacted by the Syndrome off our coast – the Sunflower Star. It made me clench my teeth and hold back tears, understanding fully why he made this replica. Because, it is conceivable that this could become the only way we see this species, once so common off our coast. 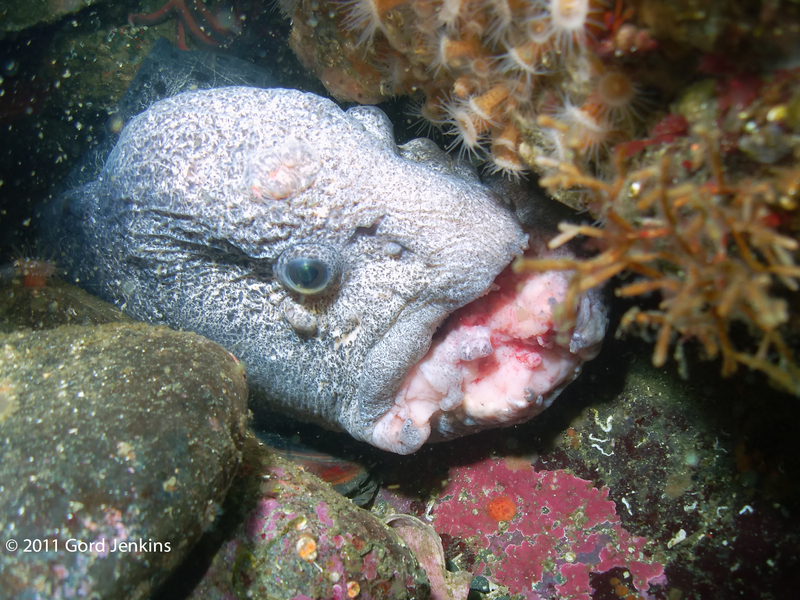 For more on Sea Star Wasting Syndrome, please see this link. Below, more images of Willam’s work and the promised video showing a mated anglerfish pair. To contact William / Bilz Rockfish, click here. The ideal for rare fish finds (deceased) is that they be of use to science and be cast for the purposes of education and conservation. Underside of a 51 cm Black Skate. Grunt Sculpin (species to 9.3 cm). Close-up on the mould for the King-of-the-Salmon. Below, National Geographic video of mating anglerifish. Species is the “Fanfin Sea Devil” (Caulophryne jordani). 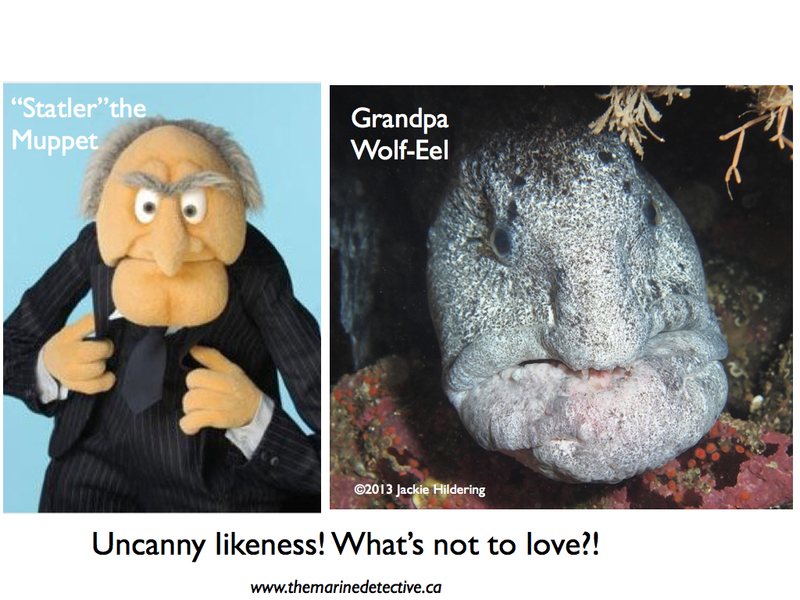 Grunt Sculpin – Little Fish, BIG Attitude! Yep, the tiny grunt sculpin is a powerful ambassador for raising awareness about the depth of biodiversity hidden in the cold, dark, rich waters of the north east Pacific. We are programmed to associate warm waters with exotic-looking fish species but read below for the Grunt Sculpin’s astounding adaptations and masterful mimicry. Grunt sculpin. Tiny fish. Giant attitude. ESPECIALLY the females. Photo: Hildering. The species reaches only a maximum of 9 cm. It is adapted to look like a giant barnacle (Balanus nubilis)! When facing outward, its pointy nose looks like a closed giant barnacle and when the fish turns around, its tail looks like the foot of the barnacle that rakes in plankton. Adapted to look like a giant barnacle! Huge thanks to dive buddy Natasha Dickinson for finding this one. Photo: Hildering. This little fish has giant attitude. When not hidden away in a barnacle (or a cup, see photo), it can be highly territorial, hopping around on its pectoral fins in a strutting, jerky fashion. A lot of literature reports that the grunt sculpin is an “awkward swimmer” but I solidly disagree. I once saw one flash away with lightning speed back to its hiding place. Yes, I was being an annoying photographer. Ah and you probably think the males are the master strutters? Ha! The female is as fierce as can be. She will aggressively chase a male into a crack, an empty barnacle shell, or other place of no escape and guard him there until she is ready to lay her eggs. When she has laid them, the male is released to do his duty. She watches him to ensure he fertilizes the eggs (up to 150 at a time) and then, according to some sources – she saunters off but may return once in a while to take on a shift. For many members of the sculpin family, the males are the sole egg guarders. 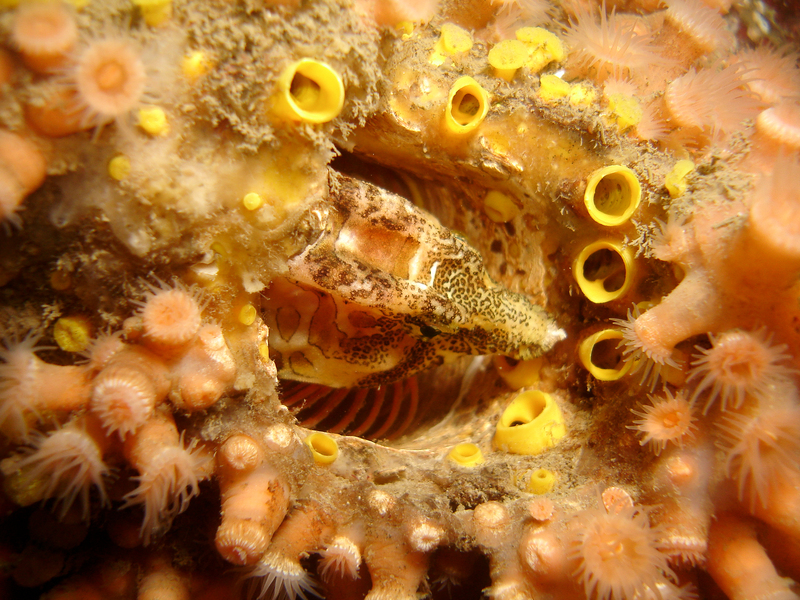 However, there are also reputable sources that report that the female grunt sculpin guards the nest of eggs. Very young grunt sculpin. The red-gilled nudibranch in the upper part of the image is only about 2 cm long. 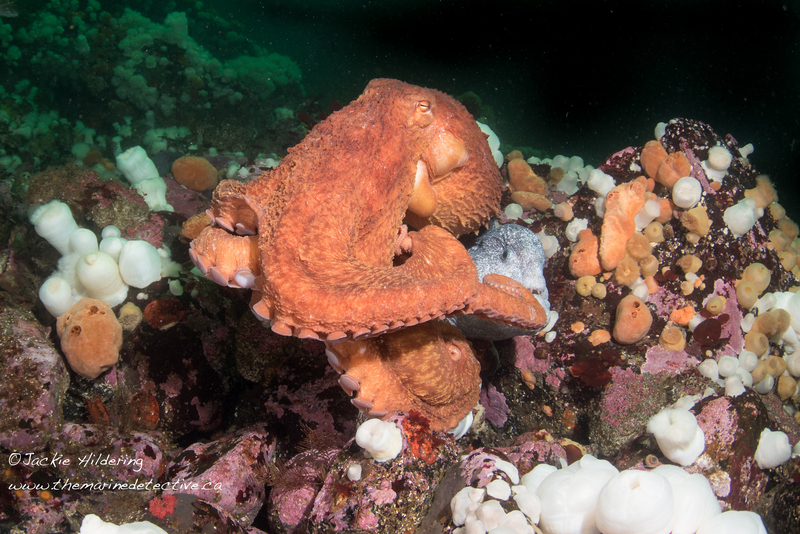 Another great find by dive buddy Natasha Dickinson. Photo: Hildering. It may even get to be more remarkable, one source relays that when the eggs are near hatching, the guarding grunt sculpin takes them into their mouth and spits them out into the open water. The suggestion is that this causes the eggs to hatch and the little zooplankton are sent on their way. (Source: Aquarium of the Pacific). With regards to classification, the scientific name Rhamphocottus richardsonii reflects the Greek “rhamphos” for the grunt sculpin’s bill-like snout. This makes some people think that the species looks like a seahorse but note that they are not closely related at all. The grunt sculpin is the only member of its genus. It is truly one of a kind. Juvenile Grunt Sculpin #1 of 3 photos. ©2017 Jackie Hildering. Juvenile Grunt Sculpin #2 of 3 photos. ©2017 Jackie Hildering. Juvenile Grunt Sculpin #3 of 3 photos. ©2017 Jackie Hildering. Oh, and the name “grunt” sculpin? Apparently the species grunts when it is taken out of the ocean. You would too! Likely it also grunts when being defensive underwater. It is also the sound I make in my delight when I find one. It will be a very loud grunt indeed if I ever find one guarding eggs or with its tail-end extended out of a barnacle.